When British expat Andy Brown got a visit from his brother in 2010, he was surprised to be given a Trivial Pursuit card. But the bigger surprise came when he read the questions on it. “There’s one on what’s the most Catholic country in South America, the next one’s on Forrest Gump and then there’s one about me,” he said. 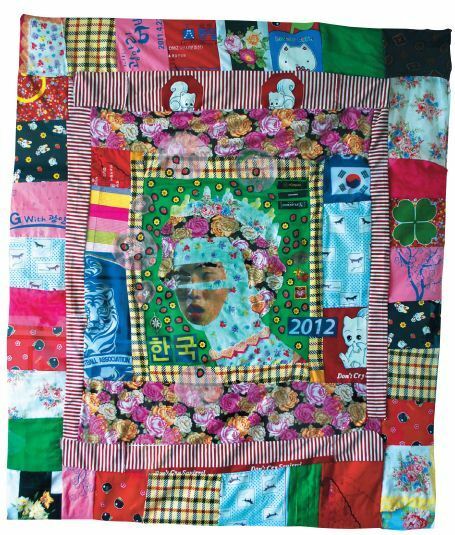 It was the biggest recognition the 32-year-old artist, who is also head of art at Busan International Primary School, had received, but it was not easy to explain to everyone. “Before that, I’d got a letter from Buckingham Palace and that was alright, but getting on Trivial Pursuit is really incredible. The only thing is that they don’t have Trivial Pursuit in Korea, nobody seems to know what it is,” he said. 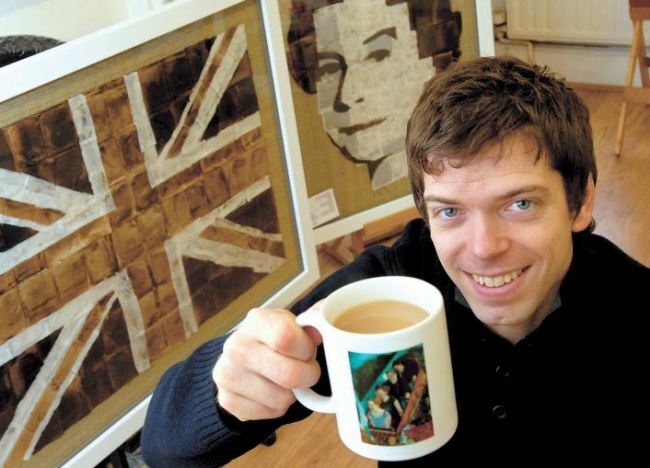 Andy Brown poses with his teabag portrait of Britain’s Queen Elizabeth II and picture of the Union Jack. The question related to a portrait of Britain’s Queen Elizabeth II he made using tea bags in 2002, while preparing for his graduate exhibition at Loughborough University in the U.K. He had been painting pictures of the Falklands War using tea as ink. “I got the idea that maybe I could use the actual tea bags that beforehand I’d been throwing away. For a while there was an intense media buzz, which Brown says has never completely died away, with TV, radio and newspapers contacting him, some from as far away as Japan. “It makes you realize how some things get people, you know, you get people just tap into it and people like it and it’s quite incredible,” he said. Brown has since worked with a wide range of media and subjects, but still makes the teabag portraits. But he says the method has changed with his feelings about the subject. 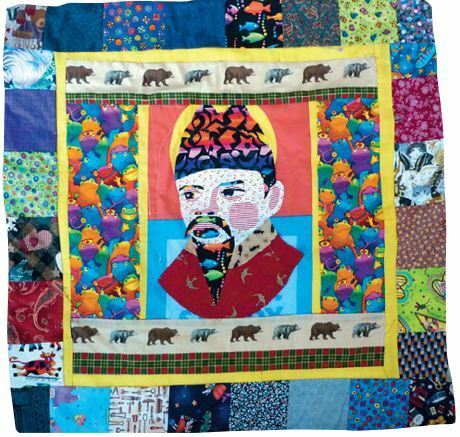 “To begin with I used to sew the teabags onto hessian, and it was all about the fragility of and icon, and the fragility of a stitch, and how these stitches were holding together this person’s face,” he said. “It was the queen and that was important but it was to do with the fragility of the monarchy and things like that. But nowadays I stick them on with glue and I use varnish them and things like that to hold them together. Brown seemed to waver on his attitude to the queen, as if he were agnostic about the monarchy, but had a lot of affection for the family against his better judgment. But he said the monarchy was a large part of British identity, however they felt about it. “It’s the idea of home or a collective culture. I think the queen’s just a symbol of anybody from Britain’s collective culture,” he said. The tea too, has a similar symbolic quality. Brown’s themes haven’t always been themed around Britain and tea. He has painted portraits of Manchester gangsters and made etchings of U.S. subjects, as well as sculptures and other items. But he says they are all loosely connected to portraiture, and he has returned to the subject of the Queen to celebrate the Diamond Jubilee. He believes 2012 could be a good year for London, with the celebrations coinciding with the Olympics after a gloomy few years. Apart from that, it’s just a good year to mark the anniversary of his most famous work. “It’s been 10 years of lots of fun with the Queen,” he said.